In volume 1 of P.O. Ackley’s “Handbook for Shooters and Reloaders” Ackley explains headspace for his improved designs as well as standard factory cartridges. The chapter describing these details starts on page 151 of that book. Professor Ackley is very clear about proper measurements, even explaining some history of how chambers have been measured. 30-30 Win. vs. 30-30 Ackley Improved. When you chamber for a rimmed cartridge like the 30-30 Winchester the headspace is measured from the locked bolt face to the forward edge of the rim where it contacts the rear of the barrel. The shape of the chamber need only have enough taper so that it will reliably extract, as the case body has not relationship to headspace in this type of cartridge. A picture is truly worth a thousand words, so note in the comparison here the drastic change in shape when a 30-30 is rechambered to 30-30 Ackley Improved. It should be an easy leap to see that a belted magnum case would be much like a rimmed case if it were to be wildcatted or modified. The belt is the headspace feature on such cases. Specifically, the distance from the fully locked bolt face to the forward edge of the belt where it contacts the barrel is the headspace in a belted magnum. Pretty much anything you say about rimmed headspace is equally true for belted case. Rimless cases is where people seem to get confused with Ackley Improved designs. First, I would heartily suggest that you read Ackley in his own words as he is pretty clear on the subject. With that said, I will give an explanation in my own words. Ackley said he regretted using the term “improved” in conjunction with these designs. I understand why he said that, not all cartridge show substantial gains in velocity from the process. The resulting increase in velocity has a lot to do with the beginning case capacity and the bore capacity relationship. In other words, the greater the increased capacity the better the velocity increase. Ackley did not suggest another name for the improved concept. 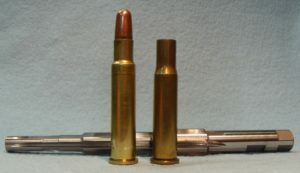 Rimless improved chambers, when properly headspaced, allow the shooter to fire the factory parent cartridge in the new improved (oversized) chamber safely. This is because the cartridge is headspaced on the junction of the neck and shoulder. Traditional Ackley gauges utilize a go gauge that is .004″ shorter than the factory or SAAMI go gauge. Because only a small point on the shoulder is in contact with the chamber it is easy to crush the shoulder as the bolt closes. When fired the brass stretches to fill the new improved chamber. This is what is known as fire-forming. 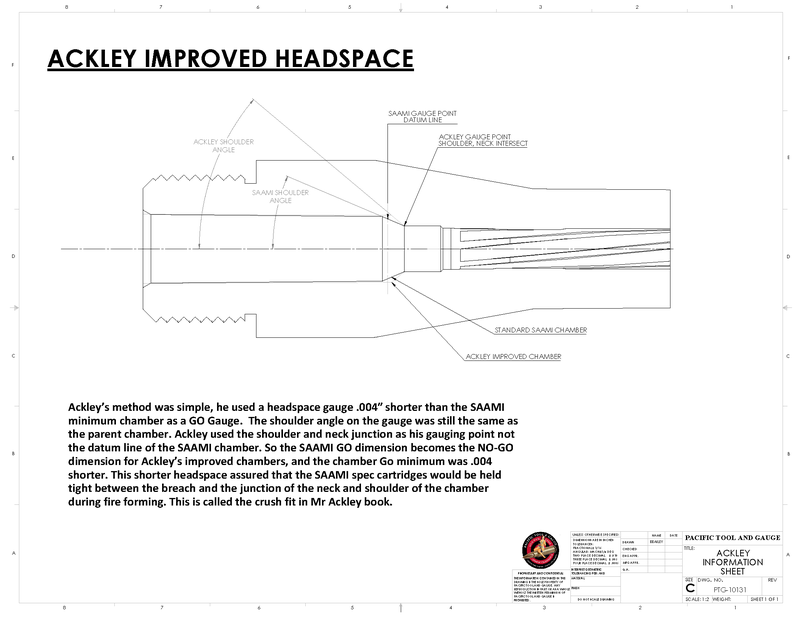 Want to learn more details of Ackley Headspace and Chambering? Click Here. 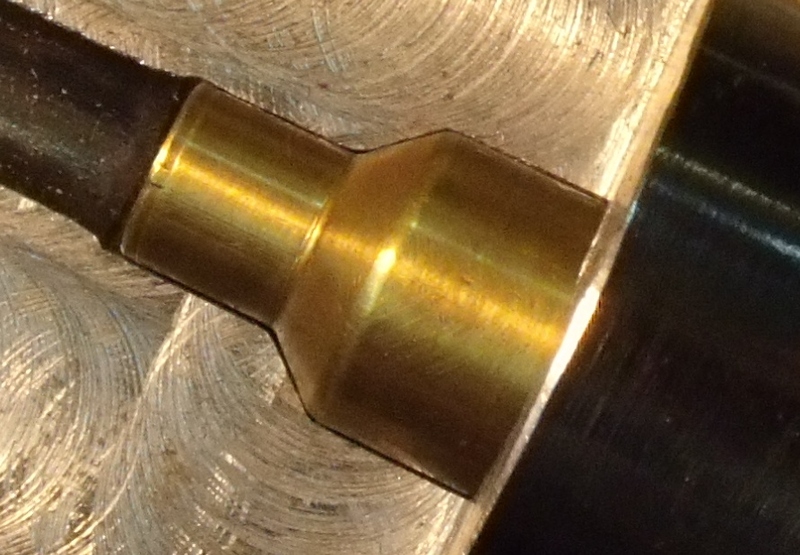 This is what it looks like when a factory cartridge is chambered in an Ackley Improved Chamber. Once fire-formed the cases can be loaded to the new potential of the Improved Chamber. I often hear shooters try to say Ackley Improved is not worth the trouble. Clearly, that is a matter of opinion. However, most reloaders are looking for more velocity; even 50 feet per second is important to such shooters. A quick calculation of the change in case capacity will tell the shooter is there is much velocity to be gained. My personal rule of thumb is that there needs to be three percent or more increase in case capacity to see any reasonable increase in velocity. Wildcatting is about having fun and spending more time with your hobby. 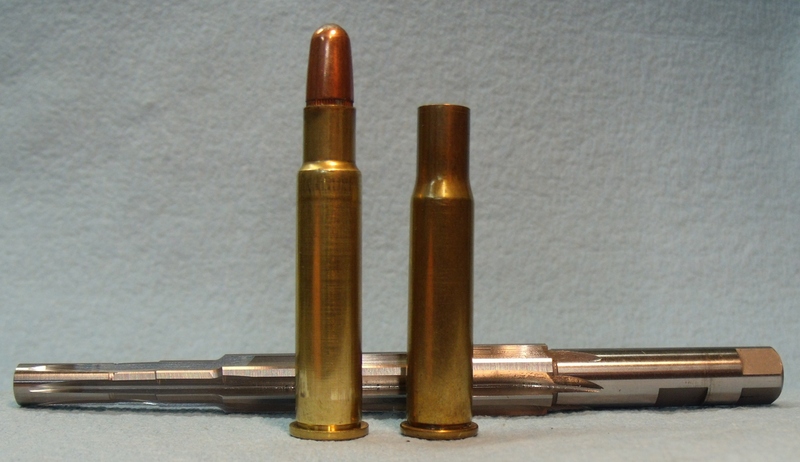 Improved cartridges are a great way to ease into wildcatting. You don’t need a bunch for specialty dies to form the brass. You just fire factory cartridges in your gun and you have a new cartridge formed. Plus, it gives you that unique gun that few, if any, at the range will have. 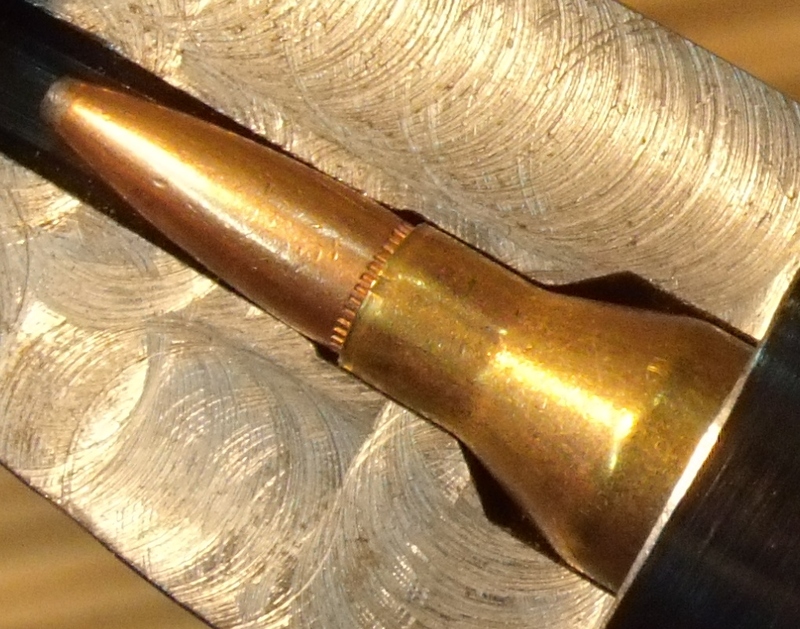 Interested in trying an Ackley Improved cartridge? You can rent the tools to rechamber your gun from our sister site: www.4drentals.com They stock all the popular Ackley chamberings and a few of the esoteric ones as well. 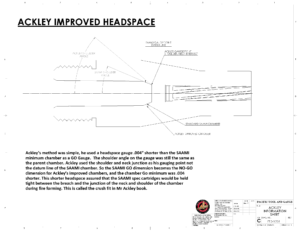 Pacific Tool and Gauge explains Ackley Headspace. I have a very nice, very accurate, Mannlicher chambered in 7×57 AI. I’m trying to get reload data for it. I’m currently using 7×57 data and working them up. Got a stellar 139 grain and 154 grain load and am looking for a 162 grain load. Best so far is one inch at 100 yards. I’ve read that Sierra may have a pdf available from the original reload data but I haven’t tried that one yet (next). The book P.O. Ackley, America’s Gunsmith contains a large amount of load data from reputable sources and with pressure data. The simplest way to start loading for Ackley Improved Cartridges is to used reliable data for the parent cartridge as a starting point. You can safely start with top published loads for the parent as they use less powder than where you will finish with the AI chamber. Personally, I look for pressure tested data for the parent, then I select the powder that used the lowest pressure to produce the highest velocity. This usually works out, but any reloader will tell you that not all barrels will shoot well with some combinations of components so plan to experiment.